It feels a bit churlish after the Chancellor delivered a stack of pension related changes things that help me personally, but in the background I suspect something much bigger may come back to bite us all. Something just doesn’t reconcile in my brain, but park the picture above for a moment while I explain why. While waiting for a phone call for a planned Interview by the Daily Telegraph after the Budget Speech yesterday, I threw some data into a graph the way I normally do if I don’t understand something. Picking at the result of this sort exercise is a step of me being inquisitive, trying to reconcile things that, at face value, don’t appear to add up. Just before the Chancellors last Autumn Statement, I was asked by my pension provider if it would be okay to give my name to the Daily Telegraph, nominally to interview me afterwards at its effect on Jane and I personally. I think because we had a SIPP plus an ISA, and there were rumoured changes to them. In the event, really little happened to either, so none of my words, nor our photographs, were used. However, one thing really bugged me, and has done ever since. I don’t normally listen to politicians at speaking at Westminster, and indeed don’t read any Daily or Sunday Newspaper. I buy the Economist 4-6 times per year (normally when they run a Technology Quarterly, or when something topical on the cover grabs me), but outside that, I tend to dip into articles by authors I respect on the Internet at large. One of these is John Lanchester in the London Book Review, whose financial journalism is very matter of fact, entertaining and his logic backed up with well researched facts. John Lanchester wrote one story in January 2013 entitled “Let’s Call it Failure“. If there’s only one article you read all year, this should be it; 4,507 words of journalism of the highest order. The one thing that my brain locked onto was, that all the talk about austerity and budget cuts, that the total amount of government spending was still headed relentlessly up every year. With that in mind, the thing that struck me during the Autumn statement was that every statistic of financial news was a hockey stick of relentless improvement, but every number quoted, without exception, was a future projection. If you laid the actuals leading up to those projections onto the exact same graph, I think most people would think the authors were on crack. Bad, worse, worse, (into projections), better, better, better. Up stood Ed Balls, the Shadow Chancellor, and I thought he’d zero in on that like a rabid dog. Instead, we got given a bit of a random rambling and wide derision, but no useful repost. With that, I largely shook my head and went back to my work. Fast forward to the March 18th 2014 budget. The Telegraph asked again if they could interview me afterwards (they had our pictures ready to go too). So, I bought three newspapers in the morning, summarised the structure of what I was likely to say, and for the second time ever in my life, listened live to a Government budget related speech. As before, the Chancellor was heavy on future GDP percentage increase projections, leading to decreases in projected borrowing, crossing the line to having income exceeding spend sometime in 2018. On the face of it, progress. This time, no mention of further targeting of the Welfare budget, which I know is 2/3 spent on pensioners and health related measures, both deemed off limit to any reduction (OAPs tend to be voluminous and willing to turn up on Election Days). Last time, there were big cuts to this planned, which I opined at the time was an unprecedented direct assault on the less well off and those in need. However, the need for borrowing is the delta between income and spend in the current account. The Chancellor made no mentions of any statistically significant further budget cuts (just caps on previously planned reductions, tied to the consumer price index into future years). The goal appears to be to have income to exceed total spend sometime in 2018 now driven primarily by a flurry of GDP percentage increases. So, in these times of austerity, the assumption of most people is that Government spending will continue to slow, glide over a peak and then begin to fall. Now look at the graph I posted above; this assumption is patently false. Why? It concerns a technical economic factor called the multiplier, and that in turn involves us in a discussion of what GDP is and how the economy works. Imagine for a moment that you come across an unexpected ten pounds. After making a mental note not to spend it all at once, you go out and spend it all at once, on, say, two pairs of woolly socks. The person from the sock shop then takes your tenner and spends it on wine, and the wine merchant spends it on tickets to see “The Bitter Tears of Petra von Kant”, and the owner of the cinema spends it on chocolate, and the sweet-shop owner spends it on a bus ticket, and the owner of the bus company deposits it in the bank. That initial ten pounds has been spent six times, and has generated £60 of economic activity. In a sense, no one is any better off; and yet, that movement of money makes everyone better off. To put it another way, that first tenner has contributed £60 to Britain’s GDP. Seen in this way, GDP can be thought of as a measure not so much of size – how much money we have, how much money the economy contains – but of velocity. It measures the movement of money through and around the economy; it measures activity. If you had taken the same ten quid when it was first given to you and simply paid it into your bank account, the net position could be argued to be the same – except that the only contribution to GDP is that initial gift of £10, and if this behaviour were replicated across the whole economy, then the whole economy would grind to a halt. And that, broadly speaking, is what is happening right now. People are sitting on that first tenner. Hence the Government derives income from taxing the flow of money, and the OBR has to make a guess on not only how much money is in the economy, but to guess the multiplier to see how intense it’s flow is. That then gives an approximate mapping to tax income, which can then offset the projected spend. And despite the historical variances (which always appear to be much better than actuals achieved), the Chancellor has queued quite a few spending plans built on those assumptions. The curious thing about previous estimates (that resulted in a shortfall), was that the economy nevertheless grew slightly based largely on a one time positive of PPI claims on financial institutions. Fines from the LIBOR fixing scandal would usually in turn also benefit flows, but the Chancellor elected to give this to charities – albeit ones likely to have to spend the money rather than pocket it into their reserves (read: savings). HS2 – all quiet – wonder why? But – how do projects like HS2 work? Currently estimated to cost £42.6 Billion. Experience in other similar projects suggest the effect is to move the London commuter belt out to Manchester, a lot of whom are going to wave as it flies by places en route through the West Midlands. A lot of the financial analysis will suggest that the government will get an infusion of cash (as they did with HS1 between London and the Channel Tunnel, in that case £2.1Bn from a Canadian Pension fund), which will be paid with guaranteed returns to that source over the next 20 years. So, the government gets a short term wad of cash, but throws it into liabilities as a flow of debt repayments, with interest, long into the future. So, what’s all this austerity thing about? Ed Milliband’s reply was accurate, that we can all feel a drop in living standards – particularly the current Governments targets of the less well off. A lot of problem statement puffery, but nothing tendered in the time available for an alternative set of proposals (if they exist – no evidence that stands up to any statistically valid scrutiny yet). As a country, we’re borrowing at unprecedented levels, and the hunger for more debt is rising like topsy. We’re largely fueling our existence from large one time shots into our current account, which add to more long term debt. The cost of servicing that debt is equally huge, so all eyes on the bond market, and ratings of our ability to pay back our debts. If it looks like we’re not tightening our belts with our spending enough, we may give the impression we’re not being prudent, and if our credit rating downgrades, the increase in interest charges alone may send us swirling into a downward spiral. One other funny in the future projections is that the Government apparently adjust the future spend levels, playing the consumer price index inflation in to deflate the currency value of our future loan payments. That helps dampen the apparent spend projections quite markedly (a bit like a snowball, but in reverse). Yet the graph still heads relentless upward regardless. So, it’s all a bit of a shell game, and our current debt levels are 10x that of those in 1980 the last time we all felt deep austerity – just before the financial markets were deregulated. So far, i’ve not found how the graphs subdivide into what the spend categories are. The Government appear to have not decided to reign in final salary pensions that the rest of us had to, based on commercial affordability. And things like Trident, HS2 and countless other money sinks are also still in the future mix. 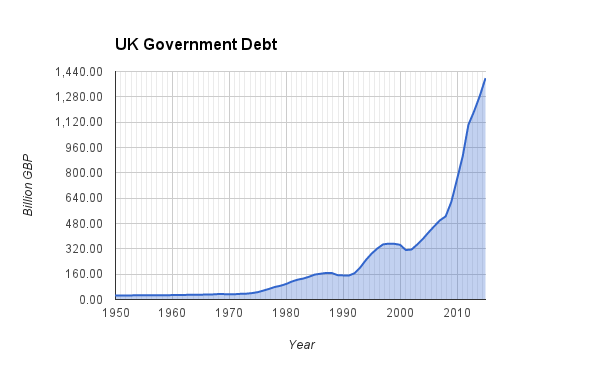 And UK Government debt levels are still rising relentlessly. The only historical precedent is that of the fall of Rome, where the currency ended up being devalued into oblivion leading to an eventual collapse. Something successive UK governments appear to ignore – so far. I wonder if it would be more prudent to systematically reduce our current huge, relentlessly growing debt levels. Harold McMillans warning concerning “selling the family silver” are now ignored, and i’m not sure the new owners have our own long term interests at heart. ← NFC and it’s route to, eh, oblivion?